The Jacquard J100 and J500 Videocomputer line was developed at the home offices of Jacquard Systems, Inc. in Santa Monica, California. Development started in 1975 and by 1977 the first units of the J100 were installed. 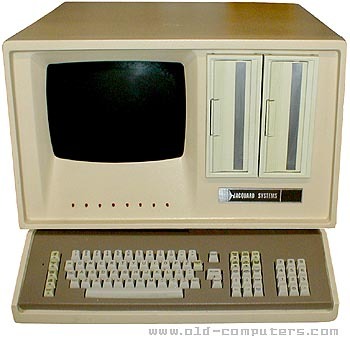 The base unit included two 8" single-sided floppy drives and could be expanded to up to 14 users. The OS was Jacquard's own DOS. The CPU of the J100 was National Semiconductor's IMP16 microprocessor and the J500 - a follow-on single-user system - was implemented using the AMD Bit-slice technology CPU architecture. The J500, thus a multifunction monopost system, could be used for wordprocessing, mass-mailing, accountancy or stock control. The J505 version featured the same motherboard plus a piggyback that allowed 2 additional terminals to be connected. The AM Jacquard J-500 was composed of a central unit keyboard/monitor and two disk-drives. From 1 to 4 optional hard-disks could be added. The hard drives were the Pertec 14" with (I think) 10MB fixed and 5MB removable ans also the Control Data 14" 80MB drive. The parallel printer port was a 12-bit port, unlike the standard 8-bit Centronics. The Xerox Diablo 1640 daisy wheel printer could be attached to it as well as many other printers. The J500 was unique at its time because all of the CPU and ALU was stored and executed from a bank of 32 Proms (Programable Read Only Memory). The J100 could actually handle 64 interupts.This included stations and printers. It was limited to 16 because of hashing. Display was performed by the same ROM/microcode/ALU that provided the main processing, timesliced in alternate 'quads' - 4 microcode instructions per process cycle. Special thanks to Randy Larson who sent us many pictures and information. The Jacquard engineers wrote the microcode on the proms that provided the higher level instructions. see more AM International Jacquard Systems J100 - J500 Ebay auctions !